Differentiate, distinguish, compare and explain what is the difference between entrepreneurship and entrepreneur. Comparison and Differences. Entrepreneurship means start a new business or own company. For accomplishing these entrepreneurs, requires a business plan and resources. In today’s era, it is a key to economic development. Several aspects like industrial growth, employment, regional development etc are nowadays dependent on entrepreneurship. Let’s see some of the facts about Entrepreneurship and Entrepreneur. The word entrepreneur are derived from the French word ‘enterprendre’ it means “to undertake” and literally translated means “between-taker” or “go-between”. An Entrepreneur is an individual who takes a risk and starts something new. It requires optimization of performance by continuously evolving ideas for the business operation to get an effective and efficient system from it. New ideas are always tentative so entrepreneurs required patience in order to get a positive result and should also have an ability to bearing the risks in the process of it. 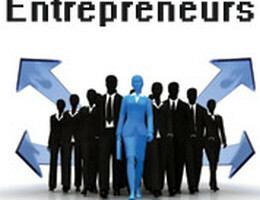 Entrepreneurship process enhances the managerial capability of entrepreneurs. It increases their decision-making skills. – The unexpected success or failure or any unexpected outside event. – Innovation based on process need. – Changes in industry and market structure. • Risk and uncertainty bearing. – Perception of market opportunities. – Managing human relations within the firm. – Managing customer and supplier relations.